These are my bikes. 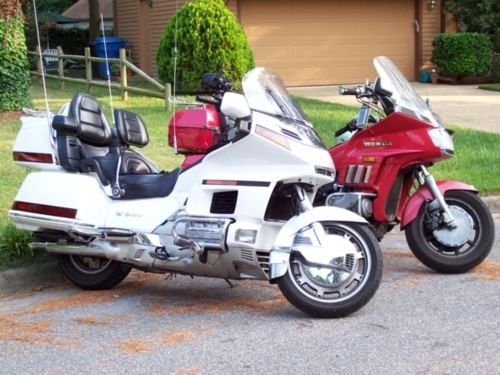 The red one is a 1985 Honda Goldwing 1200 Interstate. I have been riding this one for 6 years now. It had 76,656 miles on it when I bought it. I have added another 75634, bringing the total 152,290 miles (as of July, 07). It doesn't look so good any more, but it runs great and rides great. I have a lot of good riding memories on this bike, but since I got the 1500 I hadn't touched it. So I had to do the needful and I sold it to a guy that is getting the enjoyment out of it that I used to. 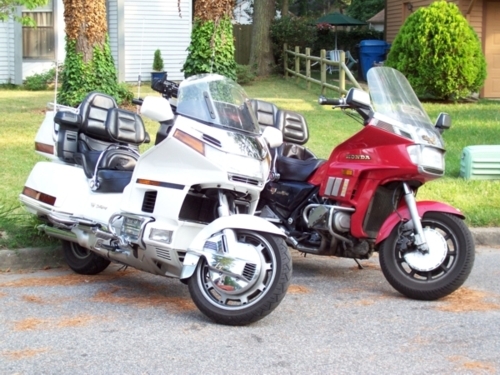 The white one is a 1996 Honda Goldwing 1500 SE. This got this one Jan of '07. When I bought it, it had 54,053 miles on the clock. It has about 69,000 as of May 08. I recently did a carb overhaul on the 1500. To see the details, go to my 1500 carb page. Go to my 1500 Rear tire page. Go to my 1500 Front tire page. My headlight modulator installation: Headlight modulator page. My home made trailer: Trailer page. My Harbor Freight lift: Lift Page. My Firecreek tank bag: Tank bag page. Planning a GL1200 waterpump change? Go here for: Parts list.